Dr. Donald A. Henderson was an American physician who coordinated the World Health Organisation’s efforts to eradicate smallpox. After smallpox had been declared eradicated in 1980, he returned to the US, and became the Dean of what is now the Johns Hopkins Bloomberg School of Public Health. Dr. Donald A. Henderson died this month and will be remembered as a great scientist and public health physician. As a child in late 1950s I remember a smallpox epidemic in Dilla in Ethiopia. I was so fortunate to have met this remarkable man, and listen to a talk he had at WHO in Geneva. 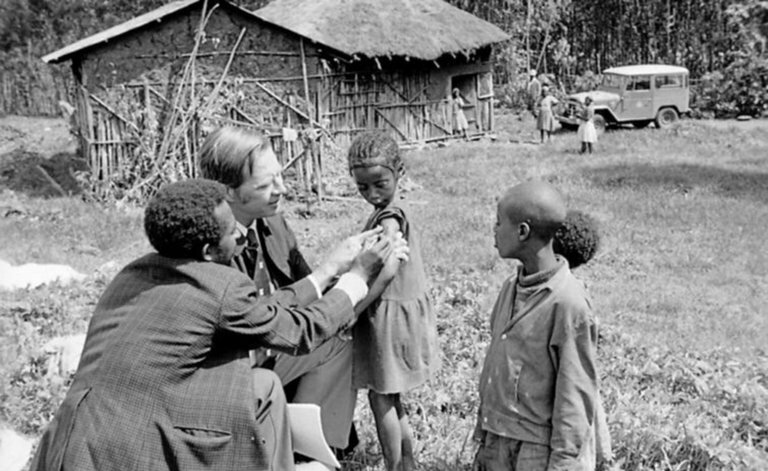 Because of the success in eradicating smallpox, many believe that it also should be possible to eliminate other diseases such as poliomyelitis, Guinea worm, measles, or even malaria. I find it interesting to read that Dr Henderson was rather skeptical about these new eradication initiatives. Both the characteristics of the diseases, as well as the efforts put into getting rid of the diseases differed from what was the strategy to eradicate smallpox. 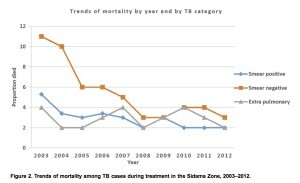 Background: Ethiopia is one of the high tuberculosis (TB) burden countries. An analysis of trends and differentials in case notifications and treatment outcomes of TB may help improve our understanding of the performance of TB control services. 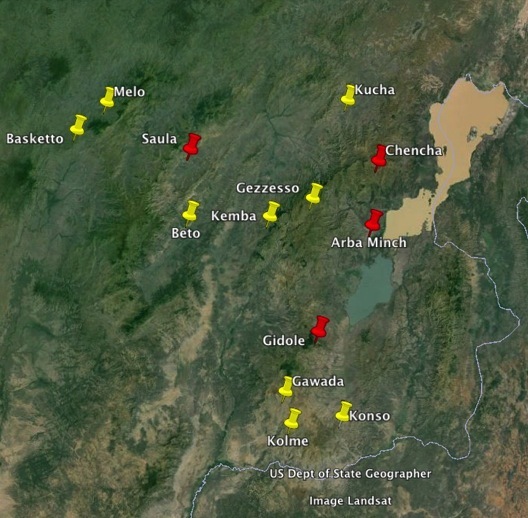 Methods: A retrospective trend analysis of TB cases was conducted in the Sidama Zone in southern Ethiopia. 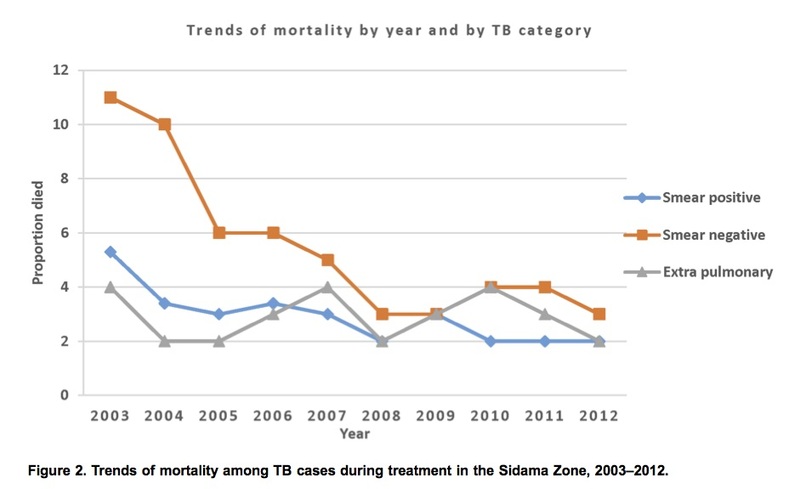 We registered all TB cases diagnosed and treated during 2003–2012 from all health facilities in the Sidama Zone, and analysed trends of TB case notification rates and treatment outcomes. Results: The smear positive (PTB+) case notification rate (CNR) increased from 55 (95% CI 52.5–58.4) to 111 (95% CI 107.4–114.4) per 105 people. The CNRs of PTB+ in people older than 45 years increased by fourfold, while the mortality of cases during treatment declined from 11% to 3% for smear negative (PTB-) (X2 , trend P,0.001) and from 5% to 2% for PTB+ (X2trend, P,0.001). The treatment success was higher in rural areas (AOR 1.11; CI 95%: 1.03–1.2), less for PTB- (AOR 0.86; CI 95%: 0.80–0.92) and higher for extra-pulmonary TB (AOR 1.10; CI 95%: 1.02– 1.19) compared to PTB+. A higher lost-to-follow up was observed in men (AOR 1.15; CI 95%: 1.06–1.24) and among PTB- cases (AOR 1.14; CI 95%: 1.03–1.25). More deaths occurred in PTB-cases (AOR 1.65; 95% CI: 1.44–1.90) and among cases older than 65 years (AOR 3.86; CI 95%: 2.94–5.10). Lastly, retreatment cases had a higher mortality than new cases (6% vs 3%). Conclusion: Over the past decade TB CNRs and treatment outcomes improved, whereas the disparities of disease burden by gender and place of residence reduced and mortality declined. Strategies should be devised to address higher risk groups for poor treatment outcomes. Surgery is often the only solution to prevent disabilities and death from conditions resulting from pregnancy related complications, surgical conditions (example acute abdomen), infections, traffic accidents, falls, burns, disasters, domestic violence, and congenital defects. Until recently, surgery was neglected as a developing country public health issue. Health officials, especially in the World Health organization and in major international Non-Governmental Organizations often viewed it as expensive and unnecessary tertiary care needing advanced equipment and expertise. Recently, surgery is beginning to be seen as an integral part of primary health care. Often it is a preventive and a cost-effective way of dealing with many health challenges in poor countries. WHO now recommends that basic surgical services should be available in district hospitals, while more specialised surgery is performed at tertiary level hospitals. A recent article in The Lancet (Funk, Weiser et al. 2010) show there are less than 1 surgical theatre per 100.000 people in Africa (14 times less than in Europe). In addition, there are too few surgeons, and 95% of these surgeons work in urban areas. Death and disability in the most vulnerable groups (namely, women and children) are easily prevented or corrected by surgery. Most essential and surgical interventions can be delivered at the first referral level health institution (rural or district hospital, health centre, primary healthcare institutions) provided the health care staff know few basic skills and their institution have some basic equipment. •	strengthen capacity to deliver effective emergency surgical care at the first referral level facility, and thus working towards achieving the WHO Millennium Development Goal 5 (reducing maternal deaths). There are very few surgeons in South Ethiopia. We therefore train Non-Clinical Physicians to do essential obstetrics and surgery. Currently, this programme includes twelve institutions covering about 3 million people. Editor (2010). “What is the point of surgery?” Lancet 376(9746): 1025. Is Ethiopia reaching the development millennium goals (MDG)? Although Ethiopia has shown an impressive economic growth over the last seven years, one-third of its population remains poor. To achieve the MDG, an annual economic growth of 7 % is needed, and in the last years the growth has exceeded this critical figure. A recent conference in Cape Town evaluated the performance of different countries, including Ethiopia, on achieving the MGD goals 1. The country is making some progress on indicators such as vaccination coverage and malaria control. Child mortality rates are declining, and HIV care is improving. Unfortunately, only 11% of the population have good access to emergency obstetric care, and the levels of stunting, an indicator of chronic malnutrition and poverty, is not declining. Tuberculosis case detection rates remain low. One way to compare access to health services is to use the coverage index. The index uses some indicators for eight reproductive, maternal, newborn and child interventions. They include family planning, maternal and newborn health (at least one antenatal visit and skilled attendant at delivery), immunisations (measles, BCG and DPT3) and curative childcare (diarrhoea and pneumonia management: oral rehydration and continued feeding and care seeking for pneumonia). Unfortunately, there is still a 80% health coverage gap for most Ethiopians, and for the more wealthy part of the population, the coverage gap is still 60%, one of the worst in Africa. Currently a new health sector plan is being approved. Although the details of this plan remains unknown to the public, the vision of the government is to transform Ethiopia to become a middle-income country in a few years after the end MDG 2015. The most concrete step that I have heard about is to improve access to essential health services by setting up primary hospitals to serve a population of 60 – 100.000 people . Each primary hospitals shall provide emergency surgical services focusing on Comprehensive Emergency Obstetric Care. Improved access and improved infrastructure would in theory enable the government to reduce maternal deaths. 1.	WHO, UNICEF. Countdown to 2015 decade report (2000–2010): taking stock of maternal, newborn and child survival. Geneva: WHO and UNICEF; 2010.